Born at Golden Bridge House, County Dublin, Ireland on 4 June 1833, the eldest son of Major Garnet Joseph Wolseley and Frances Anne Smith. He received his early education in Dublin then took employment in a surveyor’s office. Wolseley received his commission as second Lieutenant in March 1852 and was sent to Burma. He was promoted Lieutenant in 1853 and received the Burma War Medal. In 1855 he was appointed as assistant engineer with the 90th Foot and saw service in Crimea. In November 1857 he took part in the relief of Lucknow and in 1858 was promoted brevet Lieutenant-Colonel. He was sent to China in 1860 and, in 1861, following the Trent affair, was ordered to Canada as Assistant Quartermaster-General. In 1865 he was promoted Deputy Quartermaster-General in Canada. In 1870 he was chosen to command the Red River Expeditionary Force to quell the Riel uprising. For his successful conduct of the campaign he received a K.C.M.G. and C.B. In May 1871 he was brought home to the War Office as Assistant Adjutant General and became an ardent supporter of Cardwell’s army reforms. 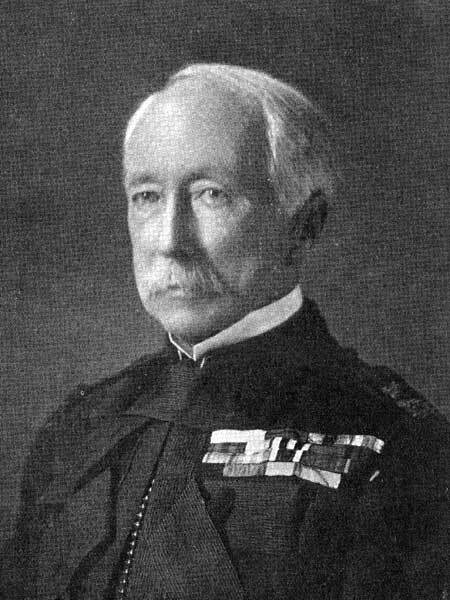 Subsequently he served in various theatres of war, including the Egyptian campaign of 1882, and was promoted General and created Baron Wolseley of Cairo and Wolseley. For his efforts to rescue Gordon at Khartoum in 1884-1885 he was created Viscount and Knight of Saint Patrick. In 1867 he married Louisa Erskine (?-?) and they had one daughter. He wrote Narrative of the War with China in 1860 (1862), The Solder’s Pocket Book (1869), The Life of Marlborough (1894) and The Story of a Soldier’s Life (1903). He died at Menton, France, on 25 March 1913 and was buried in St. Paul’s Cathedral. He is commemorated by Wolseley Avenue and Wolseley School in Winnipeg. Wolseley’s extensive papers are housed at Hove, near Brighton. There are papers at the Archives of Manitoba. The Life of Lord Wolseley by Sir F. Maurice and Sir G. Arthur (1924). The Letters of Lord and Lady Wolseley edited by Sir G. Arthur (1922).